Are you seeking the Cadillac of grills? Dead set on high-end features? Want the grill that practically cooks the meat on its own? We’ve got 3 of the very best high-end gas grill options for you – the Weber Summit S-420, the Napoleon Prestige P500RSIBPSS, and the Broil King Imperial XL. These are fully loaded grills with every premium feature you could ever dream of. Why work hard when the grill can do the work for you? These grills are packed with advanced features, but they are also simple enough that a beginner griller can learn how to operate them. Let me tell you why we think they are the best of the best. Weber is a well-known brand in the grilling industry. Their name is practically synonymous with quality grills at wallet friendly prices. And this baby is no exception. 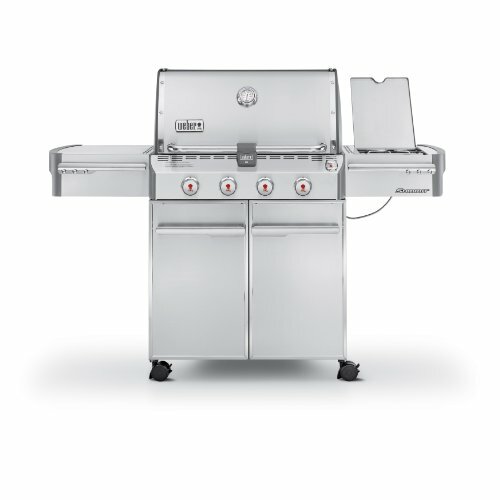 The Weber S-420 has a sleek shiny body, which is to be expected from a quality product by Weber. The summit series is the premium Weber line and it doesn’t disappoint. This is a very durable grill with high-grade quality construction and performance. With the Weber S-420, you have the option of using either natural gas or propane gas. This comes down to preference, but if you have the ability to use natural gas it is better for the environment and saves you money in the long run. 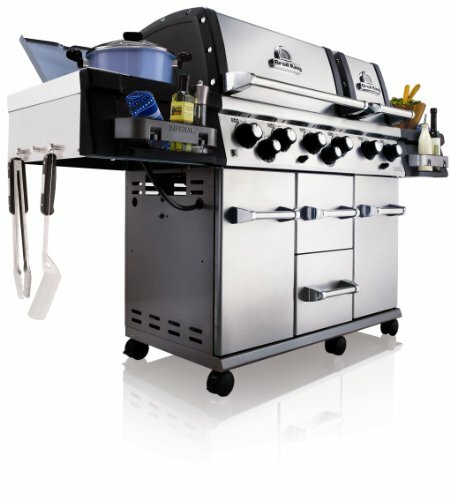 This grill has 4 stainless steel burners, with the main burners running up to 48,800 BTU/hr. while the side burner runs up to 12,000 BTU/hr. The side burner is awesome for sauces and marinades. 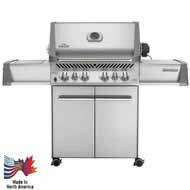 This grill also offers a large area for your cooking needs, 538 sq. inches for your primary cooking area and a warming rack of 112 sq. inches. Massive. It also has easy push-button ignition, a grill-out light for anytime grilling and a built-in, easy to use, highly accurate thermometer. Grill out light; 6 tool hooks. Enclosed cart; built-in thermometer; requires a 20-pound LP tank (sold separately). There are some other notable Weber gas grills within the same price range worth considering, such as the Weber Summit S-670 and S-620. To read more about these sweet grills, visit our article on the Best 6 burner gas grills. The Prestige P500RSIBPSS is another top-notch grill by Napoleon. For more than 30 years, Napoleon has been committed to producing quality products combined with honest, and reliable service to its customers. This grill was made from sleek and durable 304 stainless steel, which makes it rust resistant and long-lasting. The same stainless steel was used for most of the grill’s inside parts as well. A lot of lesser quality grills cheap out and have the stainless steel on the outside only. The innovative design leaves not many places for grease to collect, making this one extremely easy to clean. The Napoleon Prestige gas grill is pretty much the total package. You’ve got up to 6 burners that can run up to 78,500 BTU. With 4 main burners, 1 infrared rear burner, and 1 infrared side burner making this one hell of a versatile gas grill. You can cook your burgers more than … 6 DIFFERENT ways. With a total cooking area of 900 sq. inches you can grill a ton of food all at once. This grill also has the WAVE rod cooking grids characteristic of Napoleon. The unique design of the rod provides especially even heating and also prevents slipping of smaller meat between the cracks. Another great feature is the infrared Sizzle Zone side burner. This side burner can heat up to nearly 1,800 degrees Fahrenheit in mere seconds. This is great when you want to get a perfect sear on your steaks. You can easily cook meals for you and your family with the utmost ease with this baby. And the best part about this little beauty? It’s customer service is top-notch and you always get a great warranty when purchasing Napoleon. The Prestige retails at $1,399 or $1,394.50 on Amazon with 4.5 out of 5 stars. Definitely a great value for your money and should be on anyone’s radar when purchasing a new grill. 4 main burners; 1 infrared rear burner 1 infrared side burner. 900 sq. inches of cooking area. Heavy- duty rotisserie kit; infrared Sizzle Zone side burner. His royal highness, Broil King Imperial XL, is a big, full-featured, heavy-duty grill. This majestic beast is part of the Imperial series of Broil King and is a serious high-end grilling machine. If you love to grill and you love to grill with all the amenities, this guy should top your list. The Broil King 957647 is primarily known for its superior performance and awesome features. This grill has the Sure-lite ignition system that lets you start grilling with just the push of a button. The king may look intimidating, but the folks over at Broil King made sure that casual grillers could also use it. The cooking grids on the Imperial are great for cooking, but also great for getting a nice sear on your meat. The cooking grids have excellent heat retention, are easy to clean, and very durable. This is a an investment grill that will last you for years and years. The Dual-Tube burners ensure that there is consistent flame on the front and the back for even heat distribution. There’s a built-in-Accu-Temp thermometer, which gives you a very accurate reading. Want to roast some chickens? It comes standard with a rear mounted rotisserie for when you want juicier, slow roasted meat without purchasing an add-on kit. Music to our carnivorous ears. This grill also has a massive cooking space of 1,000 square inches, which equates to about 24 burgers, sizzling away at the same time. It definitely gives you plenty of room to cook for a crowd. And if you want to move the king around, you have lockable casters to make mobility easy. The Broil King gives you ample elbow-room and doesn’t squeeze all the burners together. This beast is only going to set you back about $1,601.24 on Amazon. It even offers 10-year warranty on the burners and a 2-year warranty on parts and paint. It can also run natural gas! Not many grills come loaded with this many features for this price. If you’re in the market for a high-end grill, this is definitely one to consider. How about the MHP grills for a long lasting grill a little over $1,000? Are you familiar with them? Thanks. I don’t have a ton of experience with MHP but they are pretty awesome grills. They are one of the few American made grills which is tough to find these days. The price is kinda steep for what you get compared to other brands with similar features. They look solid built though and will probably last you a long time. Its definitely a grill I would seriously consider looking into if you want a made in the USA grill. hi Jason thanks for the education and review. Would like to know your comment on these super hot BBQ? I just want the 800 degree fast cooking, but Ill have to wait till prices come down.